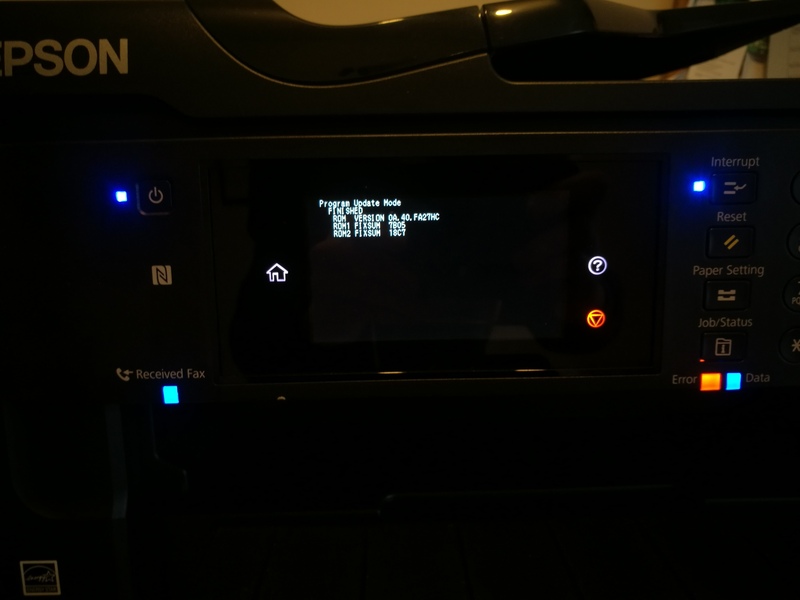 Step 4 - After a few minutes the screen of the printer said finished and showed ROM version FA27HC but also several lights started flashing (see picture). Waiting and Pressing the touch screen (or anywhere else) did nothing. I had to pull the electricity plug to shut it down then plugged it in again and the printer started normally. Downloaded the licence.exe file from the top of this page: https://chiplesssolutions.com/download.shtml and ran it. Pasted in the activation key that I had sent by email after making payment and switched the printer off and on as described. The printer took about 5 minutes to start up but when it finished - no more messages about incompatible ink cartridges- hooray! Well worth the ВЈ34 I paid to get my printer back. Have now switched off the upgrade reminders on the printer and on my computers so I don't make the mistake of 'upgrading' again! (but I have made a copy of my recovery code that was generated by the activation key, so should I have the same problem I will hopefully be able to use it again).